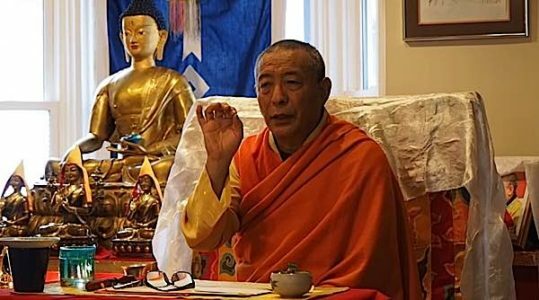 Venerable Zasep Tulku Rinpoche, spiritual director of many meditation centres in Canada, U.S. and Australia, returns to Gaden Choling Toronto Canada March 23-April 4 2018. He is currently teaching in Mongolia. In a short 20 minute video teaching (followed by a brief guided meditation), H.E. 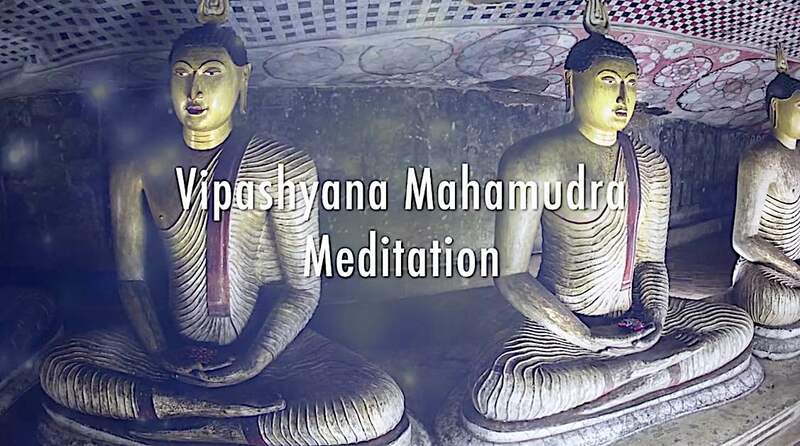 Zasep Rinpoche introduces and clarifies the complex concepts of Vipashyana Mahamudra (Vipassana in Pali): literally: “liberating the mind.” [Video plays below. Full transcript below video (pending)]. Practices include, mind observing the mind, mind as object and mind as subject, mind as object and “I” as subject. Although the teaching is an advanced topic, Rinpoche helps clarify a subject that sometimes baffles students. After the teaching and the short medtiation, enjoy Yoko Dharma chanting the Shakyamuni Mantra: Om Muni Muni Maha Muni Ye Soha. Quoting from numerous texts, and eloquently illustrating with examples, Rinpoche helps spark at least an initial understanding of concept — then, encouraging students to study and learn more on this important topic. The subject of the teaching and meditation is Mahamudra. According Gelug tradition, we call also Ganden tradition. Some people maybe haven’t heard Gelug Mahamudra, and yes, we do have a wonderful Mahamudra teachings, very profound teachings. The Mahamudra practice, according Gelug lineage, is a direct one. It came from Buddha Shakyamuni then to Manjushshri. The lineage from Manjushri to … Lama Tsongkhapa. And then it gradually come down to the first Panchen Lama Losang Chokyi Gyaltsen. And then, come down to current, until now. It’s unbroken lineage, we have. And a very unique practice. So, there are different levels of Mahamudra. First of all, Sutra Mahamudra, Tantra Mahamudra, two levels and Sutra Mahamudra, also has two levels; Samatha Mahamudra and Vipashyana Mahamudra. At this point I was requested to talk about Vipashyana Mahamudra, because Samatha Mahamudra is quite common, especially in the Kagyu tradition. And there are a number of books and you can find them. And some of the Mahamudra teaching according Kagyu and Gelug are more or less same, or similar. I should say similar. And Vipashyana Mahamudra is different. For this is why I am talking here, Vipashyana Mahamudra. And Vipashyana Mahamudra is also known as a Madayamaka. And Uma Chenpo, a Tibetan word. Uma Chenpo means great Madayamaka. Lama Tsonghkapa himself used the term, uma chenpo instead of Mahamudra, then the first Panchen Lama Losang Chokyi Gyaltsen, he compiled root texts of Mahamudra and auto-commentary, his own commentary. So there’s lots of details on Mahamudra teachings. I have received this teaching from my Guru. So at this time, I will explain little bit, Vipashyana Mahamudra… So, usually when we do Mahamudra meditation, we meditate on the mind. The subject is the mind. The object is the mind. The subject is coarse mind. The object is subtle mind. So it’s like mind to mind, according Theravadan Buddhist Vipashyana meditation, there’s a word called mind to mind, body to body. Okay, kind of like that mind to mind. So, here the object is the mind. Now, I should actually say, the literal meaning Mahamudra, Mu is shunyata, emptiness. Dra is liberating quality. When you experience shunyata, Mu, emptiness of the mind, then your mind will be liberated. This is the great one. This is why Maha means the great one. Very famous Indian Buddhist philosopher, Master Aryadeva, said in his Four Hundred Verses… said even slightest doubt or when you have a doubt or some inquiring mind about shunyata, that is marvelous. That inquiring mind of shunyata will eliminate or destroy your samsara, like you’re holding chopping knife and chopping down vegetables or chopping some material. So this is example, very beautiful and powerful. So here, meditating on the mind, and you focus the mind on the mind. But here, now Vipashyana Mahamudra is meditating on emptiness of the mind. Okay. So first of all, I should say a few words about the mind. What is mind anyways? So, mind is consciousness. We have primary mind, and secondary mind and mental factors, and so forth. I’m not gonna go into all this detail. And you can study text Pramanavarttika, and Abhidarma, and Madyamaka, and so forth. So, according to Prajnaparamita Sutra, states mind doesn’t exist within the mind. The true nature of the mind is clear light. Okay. So, when it says mind doesn’t exist within the mind, that means when you look at the mind, you cannot find the mind on the level of inherent existence. You cannot find. That’s why mind doesn’t exist within the mind. True nature of the mind is clear light. The more you meditate on the mind, you experience the nature of the mind is luminous and clear light. And spacious. And stillness. Okay. So the Tibetan word for this is ‘Semla sem mache! Sem kyi rangzen osel wa wo!’ Okay, this is from the Prajnaparamita Sutra. Semla sem mache! Sem kyi rangzen osel wa wo! Okay, ‘Semla sem mache’ means mind doesn’t exist within the mind. And ‘Sem kyi rangzen osel wa wo!’ means nature of the mind is clear light. Now, when you meditate on the mind, look at the mind and you can’t find mind. It’s like you peeling the onion, keep peeling, peeling, nothing left. All you have is the onion, there’s no seed, there’s no solid substance. Okay, that’s one example. So now, I will explain the technique, how to meditate. According in Ganden Tradition, and Gelug Tradition, first we’ll, first of all you meditate on emptiness of personality… that make emptiness of personality. And emptiness of the mind. As the Buddha said in the Heart Sutra, form is emptiness. Emptiness is also form. There is no form other than emptiness and no emptiness other than form. Likewise, feeling, perception, mental formation and consciousness. So consciousness emptiness. Emptiness is also consciousness. There is no consciousness other than emptiness. There is no emptiness other than consciousness. First of all you sit on the cushion, comfortably, meditate. And you do mindfulness breathing. We do nine-point breathing exercise and do some of the Mahamudra and observing your mind. Your mind is observing the mind. It’s called resting the mind in the natural state. So you sit down, resting your mind. Resting the mind in the natural state. So, resting, the word resting is very important one because our mind is restless, as you know. And always thinking, thinking, thinking, thinking, asking questions, this and that, busy, busy, busy. And you, your mind becomes so restless and thinks so much, and your mind is exhausted. So that’s why we need to do resting mind. Just like your body, when the body’s tired you need to rest. Right, you sit down or lie down and so on. Resting the mind in natural state. Why natural state? Unfabricated and unaltered mind. Just be here and now in the present moment. Just be. Just rest the mind in the natural state. Try cultivating a calm abiding mind. Not intentionally. When you are sitting resting your mind in a natural way, natural state, then calm abiding mind is happening naturally. So that’s the foundation. Then you do the Vipashyana Mahamudra. So you observe your mind, okay look at the mind. And you don’t see the beginning of mind. You don’t see the end of the mind. And you don’t see the mind right now, right here in front of you. And all you see is the subject of the mind and the awareness. Your mind is the awareness and knower and cognisor. That’s all you have here. You should know that. And you see now, where is mind. You experience some aspect of emptiness of mind and what we call the dawn of emptiness of the mind. Then suddenly, some thoughts come, right? And you see it all, this thought, that thought. But that is your mind, but that thought already came. Not here. You cannot see the mind and in other words, your mind, the subject mind and object mind cannot be same time. Cannot be simultaneous. They don’t exist simultaneously. You only see the second moment of the previous thought that is already rising. So that’s previous thought now, and that’s okay. You see that, and then it’s gone. But no longer holding, just let it go, let it go and stay in this moment. Then naturally, awareness of the mind is here. Awareness is here. And stillness is here. And spaciousness of the mind is happening. And some level of emptiness is happening. Experiencing little bit. This is your focused mind on that. And this is Vipashyana Mahamudra. Then, that’s the mind, right focused mind on the mind. But then what about I? What about self? I am the person who’s meditating on Mahamudra. I am the meditator of Mahamudra. Where is I or self? Same way you look at the I. Okay, so now your mind is the subject. The object is I. Where is I? What is I? Not so much, about where is I, but what is I? Also, what is self? I or self or me, all those different labels right, it’s the same thing. So what is self? What is I? I is only the concept of I. Self is only the concept of self. There is no self other than the concept of self. There’s no I other than the concept of I. It’s a label. We’re imputing the label of self and I on this form, this body. We got this habit of doing this. It’s there. Now, is that wrong? Putting the label of I or self? No, nothing wrong. Not only you do have to put label I or self in order to communicate on a conventional level, right? Nothing is wrong. As long as you’re not grasping onto self and I. As long as you don’t grasp on self and I, this is the point. So when you meditate in this way, your grasping mind of self or I will be subside. Gradually become less and less. You only have the concept of self or I. Nominally and you function yourself in this light in this way, dependent arising an emptiness, both at the same time. Lama Tsongkhapa’s advice: one should mediate on emptiness, dependent arising, both co-exist. They do co-exist. There is no emptiness without dependent arising. There’s no dependent rising without emptiness of self. Going back to the meditation, so you observed self and me. There’s no self and me. Where is self? There’s no self. It’s like you are imputing the label on a car and a machine — car — let’s say Toyota or whatever, or Honda, or Hyundai and Kia, whatever. So you impute the label on car and you have all the parts of car; engine and wheels and transmission and et cetera, et cetera. And you impute the label, made in Japan or made in Korea, and then it becomes a car. And when you take them all apart, there is no Toyota or Honda, just parts. But at the same time, on that relative level, there is mind, there is consciousness, there is I. I am the one who’s meditating. I am the one creating good kharma. So you make the conclusion, closure this way. A brief explanational emptiness of the mind and person and Vipashyana Mahamudra meditation according to Gelug Tradition. So I like to leave the meditation on resting mind in the natural state. I would like to ask everybody sit comfortably on meditation cushion or on chair. Keep your back straight. So, resting your mind in a natural state. Which means, your mind is in the present moment and here, right here. Do not go to the past. Do not go to the future. And only be here, in this very moment. H E Zasep Rinpoche teaching in 2016 at Gaden Choling. Rinpoche will also teach a weeekend retreat on Medicine Buddha at Owen Sound, Ontario. Fri., Mar 23rd, 7pm-9pm: Vajrasattva Yab-Yum Tantric Initiation. This Initiation is extremely rare, again from the “Clear Vision” of famed Gelugpa Yogi and Mahasiddha Takpuwa Dorje Chang in the 19thC, like Chittamani Tara and is both unique to the Gelugpa Tradition and unique in that it combines the Deity practice of Amitayus, the Buddha of Infinite Life with the Guru Yoga practice of Guru Rinpoche. In terms of Gelug practice, this makes it very singular & special. It is a healing and long-practice as well. H.E. Zasep Rinpoche will teach and give commentary on how to do basic Tantric practice & rituals as well as Tantric Feast Offerings. 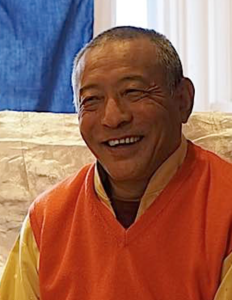 Venerable Acharya Zasep Tulku Rinpoche is Spiritual Director of Gaden for the West, with meditation centers in Canada, Australia and the United States. Rinpoche is popularly known for his approachable teaching style, strong humor and teachings based on a long lineage of great lamas. His own gurus included the most celebrated of Gelug teachers: His Holiness Kyabje Trijang Rinpoche, His Holiness Kyabje Ling Rinpoche, Venerable Geshe Thupten Wanggyel, His Holiness Kyabje Zong Rinpoche, Venerable Lati Rinpoche, Venerable Tara Tulku Rinpoche and Venerable Khalkha Jetsun Dampa Rinpoche. Rinpoche is spiritual director of many temples, meditation centres and retreat centres in Australia, the United States and Canada. He was first invited to teach in Australia by Lama Thubten Yeshe in 1976. “Sometimes when you wait, it gives you time to grow and flower into something much more beautiful then you had ever imagined. This is the case with Yoko Dharma. The last 5 years for this Canadian born recording artist has been full of growth opportunities as she has patiently been waiting to record her RnB debut album “Freedom Reign.” Now her album is almost complete! Producer Marty Rifkin is working on this album with Yoko, bringing “Freedom Reign” to life and helping Yoko manifest her vision into the world. Marty has recorded with Jewel, Bruce Springsteen, Elton John and numerous other well-known artists. 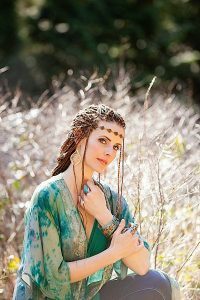 The culturally diverse world music influences drawn on to make “Freedom Reign” album, stem from Yoko’s passionate love of world music and unique world instruments, which are all a part of Yoko’s intriguing sound. Her motivation to break through cultural barriers using music as the conduit for positive global change and peace, is a call to action and transformation of one’s mind, which is given to the listener through Yoko’s conscious lyrics throughout the album. 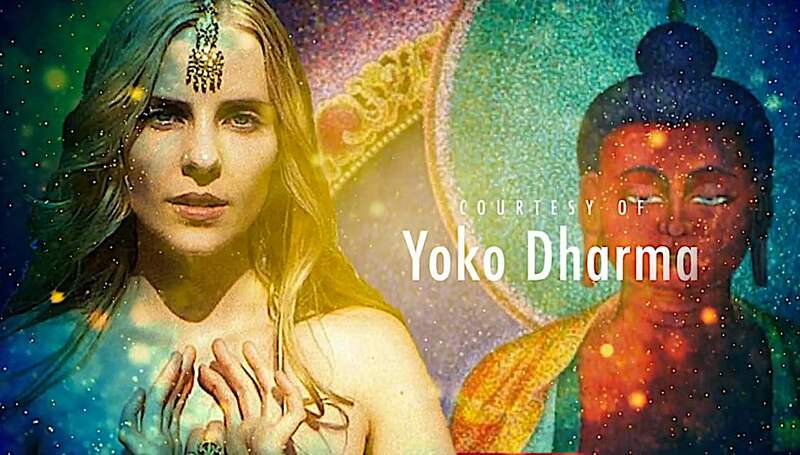 Steeped in the basic human qualities of love, compassion and awareness, Yoko draws from the deep rooted wisdom that Tibetan Buddhism has given her in her life and reflects this in her songwriting. Between Marty Rifkin’s expertise and Yoko Dharma’s strong message and powerfully sweet voice, I have no doubt that Yoko’s debut RnB album will shake the globe, stirring international fans everywhere!